Talk about the right way to ring in 2010 for graduating seniors. According to the MITX Hiring Intentions Survey, respondents plan to hire an average of six entry-level positions each in 2010. 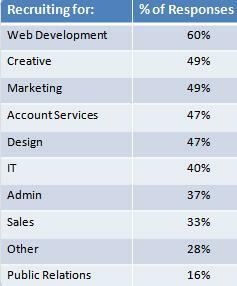 The survey was conducted to our base of 250 digital marketing, media and technology companies in October 2009. There was a 22% response rate. To see the full report click here. As a key stakeholder in the technology community of New England, we thought you might be interested in this opportunity to take part in an exciting and interactive web event today, Monday Dec 7th. The topic for discussion: How Massachusetts can seize the opportunity to become the premier technology hub.